Content marketing has been widely adopted but how are people measuring whether it works or not? Which metrics should we be looking at? The answer to that last question will depend on the business and its goals. Measuring for its own sake is pointless, it has to align with business goals. With this in mind, I’m not going to tell you which metrics are most important, but will simply present the various metrics you could use. These are perhaps the most obvious and often easiest things to look at, and can be found with Google Analytics (other analytics platforms are available of course). Simple enough. How many views did your article, video, infographic etc attract? It’s a good measure of popularity and indicates whether your content has hit the mark, especially in comparison with other pages. If the aim is to build an audience and measure popularity, or to convince advertisers, it works. However, if your goals are different, pageviews will only tell part of the story. If you’re targeting a specific audience, the number of people viewing your content is less important than whether the right people are. For example, I could write a piece of clickbait on Kanye or Trump (don’t worry, I won’t) and attract 100,000 views. However, would it help Search Engine Watch? Would those visitors become regular readers or decide to attend our events? I doubt it. This can be more precise than pageviews as views can be distorted by other factors. Dirty tricks like pagination for instance. This was previously known as visits in Google Analytics and refers to a single visit form a user, and may include them viewing several pages. I’ve covered bounce rates in more detail previously, but basically it tells you the percentage of people that left a given page on your website without viewing any other pages. It’s a good general measure of whether your content is successful in sending traffic to other, perhaps more valuable areas of your site, if that is the purpose of the content. What constitutes a good or bad bounce rates depends on the nature of the content and the business goals. This is a metric I like to use, and it’s relevant for a publisher like SEW. We aim to produce useful content that people will find useful. If we write a detailed article, and people take the time to read, that suggests it worked well and that the topic was interesting. This can them inform future decisions on content. For example, this article on internal linking has and average time on page of 4 minutes and 6 seconds, which is higher than the site average. It suggests that at least some people found it useful (I hope). Unless your content’s goals can be met with one pageview, then you’re likely to want your content to lead people to another page. Perhaps to sign up for a trial, make a purchase, or download a white paper. There are a few ways to measure this, but I use a custom segment which filters out the visitors which view three or more pages. So, for the article mentioned above, we can see how many viewed that and went on to view other pages on the site, and compare this with other pages. If the aim on your content is to attract new visitors, then this is the metric for you. Where is the traffic coming from for your content? Are you targeting social users, or perhaps search traffic? Which sources deliver the ‘right’ visitors? Which work over time? Some of these metrics can be found on Google Analytics, for others there are plenty of useful tools (free and paid) to use. NB – the bounce rate, time on page and page depth metrics described above could easily fit into this section too. Now that Twitter has killed share counts, third party tools are the easiest way to find this data. Here’s the most shared posts on SEW from the past six months, shown on Buzzsumo. Not the same as the most popular posts though. It’s interesting (and useful) to note the differences. 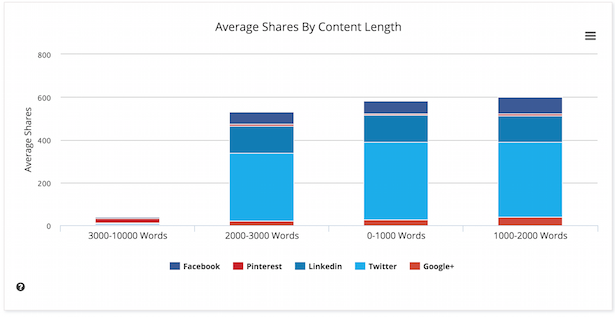 Which kinds of content hit the mark on social? Do longer posts work better? Who is sharing your content? Are you reaching influential users? Look into the detail – are you reaching people who are likely to amplify the reach of your content? Are you reaching people whose profiles match your target audience? While a lot of opinion around articles is now expressed away from the site, the number of comments on a post can still give an indication of whether the content has hit the mark. Are people clicking through from your content to the relevant pages? Sign up forms, lead generation forms etc. Is your content working from a PR perspective? 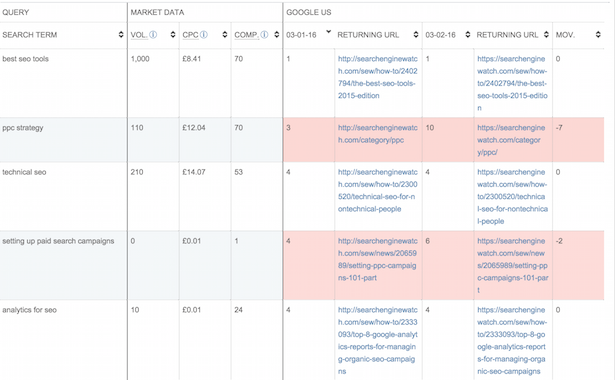 Are other sites and sources picking up on your content and mentioning your brand? SEO goals are part of content marketing, so it’s important to see what effect it is having. You’ve launched a content-driven campaign, or perhaps a blog. Is it driving more search traffic over time? If you are using content to improve rankings for certain terms, measure how the content moves the rankings, and which pages are being returned for them. Is your content attracting links? 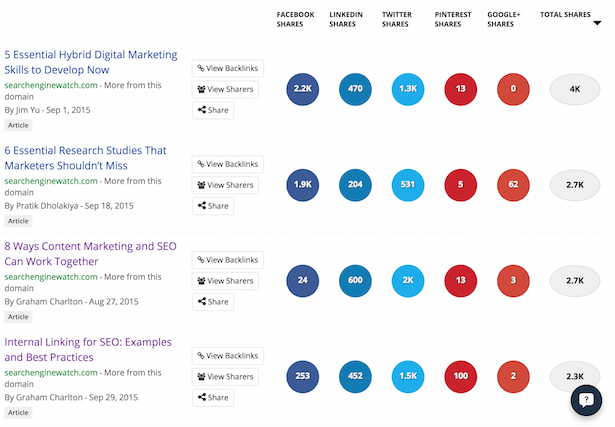 Which content attracts links from the best sources? Are you producing evergreen content that delivers traffic and leads over time? This may require more effort and investment, but it can pay off more handsomely. These are harder to measure, but remain important. Does the content help to promote your brand? Do people recall your brand? Do they have a favourable impression? What are people saying about your content and brand? Social monitoring tools, surveys etc can provide some insight here. Does your content drive sales and leads? Does it move the bottom line? This is the ultimate aim of content marketing, whatever the goals. Are people clicking through from your content and making a purchase? For example, Repair Clinic produces content relevant to people’s repair issues which ranks well in Google and leads visitors to pages like the one shown below. How many are actually making a purchase? Are people signing up for test drives, calls for more information, visits to showrooms etc? 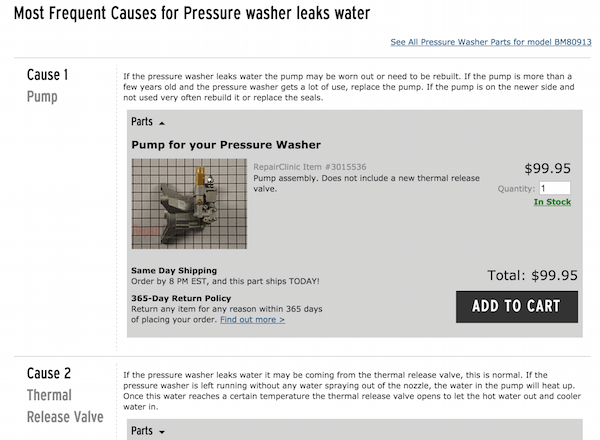 Did the content you added at a certain part of the sales funnel increase conversions? It could be better product page copy, or even a piece of micro-content explaining form fields. Does your content help to build you email list? This may not deliver an immediate return, but it contributes to email marketing ROI. How much did the content cost to produce? How many sales or leads can you attribute to it? This is the ultimate measurement, though outcomes which can’t be easily quantified should be considered. For example, if the content helped to build awareness of the brand or increased sign ups to emails, then this may deliver a return on the investment long-term.